Maynard James Keenan's Tool side-project Puscifer recently announced plans to issue a new full-length called Money Shot this fall. Though details were slim at the time, the audio-visual experimenters have now coughed up the artwork and tracklisting, as well as info on a forthcoming tour. We'd previously learned that the project's full-length follow-up to 2011's Conditions of My Parole would arrive October 30 via Puscifer Entertainment. A press release now confirms that the album will feature 10 new tracks, including the previously premiered "Grand Canyon." You can see all of the tracklisting details down below. That'd be the cover art, of Keenan and co. enjoying "money shots" at a country and western bar, up above. It's also been revealed that the act will be heading out on the road just a couple days after the album lands for a North American tour. The trip starts off in Phoenix and pretty well sticks to the U.S. club circuit. That said, there are a pair of Canadian dates on the itinerary, which take place in Calgary and Vancouver. It's noted that the lineup has shifted a bit for the upcoming Puscifer tour, with Keenan, Mat Mitchell, Carina Round, Jeff Friedl and Mahsa Zargaran to be joined onstage by recent addition Paul Barker (Ministry, Lead into Gold). Beyond the lineup alterations, the band have apparently upgraded the stage show. 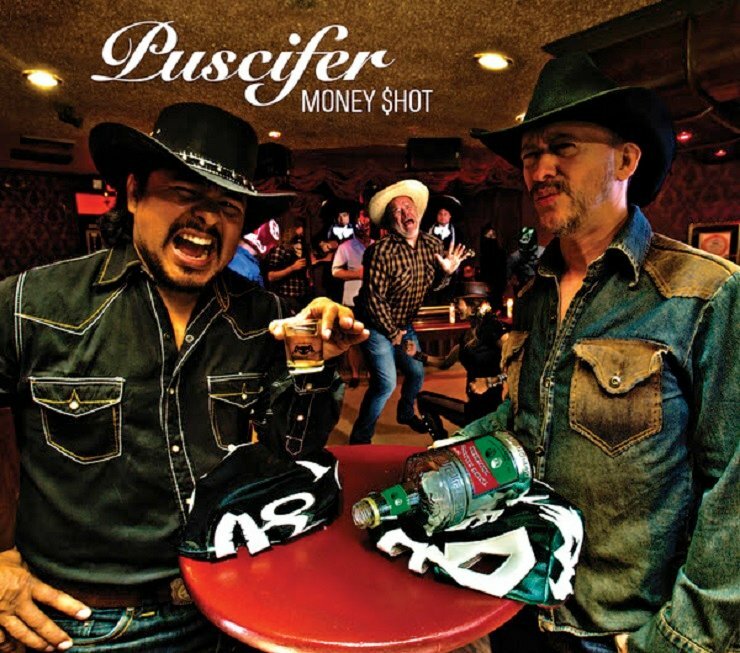 "As is the Modus Operandi of Puscifer, there will be a whole new show to accompany the Money Shot release. We've been leaving a few clues here and there as to what it may entail," Keenan said in a statement. "As usual, we prefer to Show rather than Tell. Odds are if you've been a fan of the diverse nature of our performances in the past, you'll want to go ahead and place those bets."